Now you can get this pack of Kids PAW Patrol Socks. 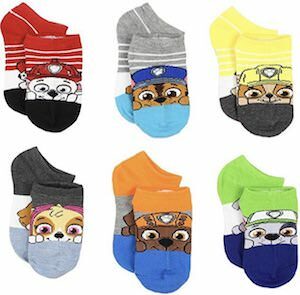 These PAW Patrol socks come in a pack of 6 pairs and each pair has a different dog on it. You will find Marshall, Chase, Rubble, Skye, Zuma, and Rocky. And these fun socks are in toddler sizes 4 – 6 so that all the little once can enjoy wearing their favorite puppy on their feet. No need to get your child boring socks because adding 6 pairs of puppy socks to their wardrobe gets them covered for a while. All these socks make for a fun present for the kids so start surprising them. Now you can be wearing these Buffy The Vampire Slayer Knee Socks. These are knee high compression socks are great for both men and women and are made from 80% nylon and 20% spandex. Socks like these are great as an everyday pair of socks that look great under shorts or a skirt and as they are compressions socks they would be nice for a run too. 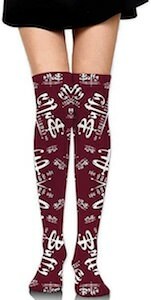 The Burgundy red socks are covered in the Buffy The Vampire logo in different sizes so that everyone that looks at your socks will know that you are a fan of Buffy and her vampire hunting skills. No more cold feet for you all thanks to these Captain Marvel Socks. These superhero socks come in a set of 3 pairs of socks and all will fit women’s sizes 9 – 11 and they are made from 98% polyester and 2% spandex. The sock pairs are all different, one pair is green, one is green and red and one is black and yellow and all have typical Captain Marvel markings like the famous star . 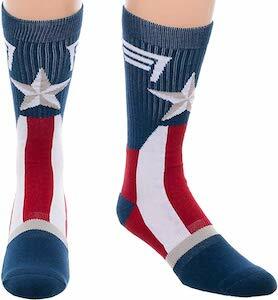 And these junior ankle socks are great for keeping your feet warm while also use looking amazing and maybe even give your some superhero powers when you wear them and if you do please let us know in the comments below. 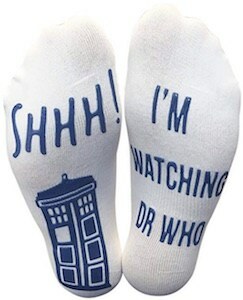 Doctor Who fan can now have these fun I’m Watching Dr Who Socks on their feet. These Doctor Who socks are great for both men and women and are just plain white but then when you look on the bottom you can find the text “SHHH!” and the Tardis on one sock and on the other sock it says “I’m Watching Dr Who”. Having these socks on your feet while having your feet on the table is just funny as then people can see the bottom of your feet. 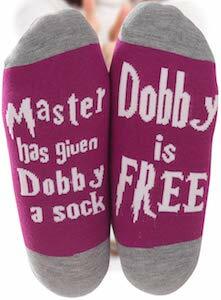 And the print on the bottom of the socks is also nonslip so you won’t slip while walking around. Bob’s Burgers fans can now have warm feet all thanks to these Louise Socks. 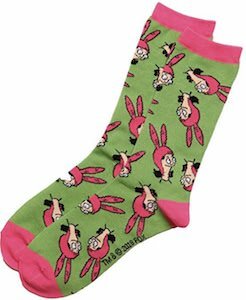 If Louise Belcher is your favorite Bob’s Burgers character and you want some fun socks then this is what you need. These Bob’s Burgers socks are the same green as the dress Louise wears and there is bunny pink on the top edge, toes, and heel and then the rest of the socks have the head of Louise including her bunny hat on it. These crew socks are made from 98% polyester and 2% spandex. Not only can you now have warm feet you can also have the badass Louise with you where ever you go like school, work, a friends house or just to be comfy at home. Game of Thrones fans all know about winter and they want to prevent getting cold feet and that is why there are these house Stark socks. The socks are great on both men and women and are made from 98% polyester and 2% spandex. 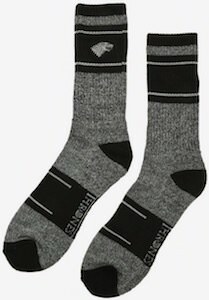 The Game of Thrones socks are grey and black and say Game of Thrones on the bottom and on the side it shows the Direwolf logo from the Starks. Socks like this are just great for all the fans and they do make for a great present too. Now you can show your feet as they look amazing in these black the face of Venom socks. 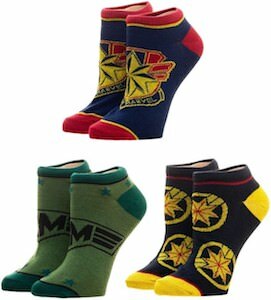 These Marvel socks will fit shoe size 6 – 12 and they are black. On the side of these dark socks you can find the face of Venom with his long tongue moving around. So now you can feel like you have a Marvel character on your feet and that makes you a true special person. 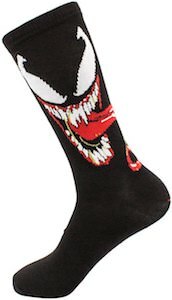 Let Venom keep your feet warm as these socks are perfect for that especially if you are a true fan of venom and his scary face. 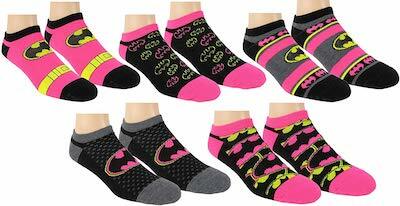 If you are a girl in need of cool socks then you should check out these women’s Batman socks in 5 fun designs. So you can get 5 pairs of Batman socks in one pack and all are different but all do have the Batman symbol on it and they all have black and pink as colors complete with grey and yellow on some. The Batman ankle socks are made for in women’s sizes 9 -11 and are just a great way to have enough clean socks and to have Batman near and always at your feet. And these Batman socks also make for a fun present for the Batman fan in your life.